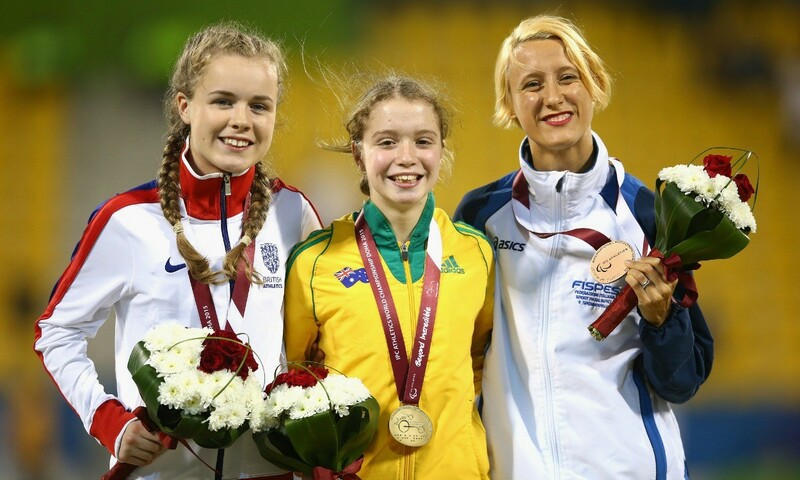 Isis Holt clocked 28.57 to take almost a second off her own world T35 200m record on Saturday, the 14-year-old getting gold ahead of her fellow teenager Maria Lyle who ran a European record 29.32 to secure silver at the IPC Athletics World Championships in Doha. Britain’s Lyle, herself just one year older than the winner, commented: “It is a great achievement to win silver and I’m pleased with the race. I’ve run a good time and it was very close. Italy’s defending champion Oxana Corso clocked a 32.20 PB for bronze. Also adding to Great Britain’s medal haul on the third day of competition was European champion Jo Butterfield and six-time Paralympic gold medallist David Weir. Butterfield threw a championship record of 21.44m to take the F51 club throw title, while in the T54 1500m Weir claimed his second silver of the championships after the marathon medal he won in London in April, clocking 3:04.46 behind Thailand’s Rawat Tana in the Briton’s first major track final since London 2012. Bronze was claimed by Thailand’s Saichon Konjen as Switzerland’s defending champion Marcel Hug finished fifth. Kylie Grimes, who represented GB in wheelchair rugby at London 2012, threw a 14.61m PB for fifth behind her winning team-mate Butterfield. Ben Rowlings finished fourth in a T34 400m race won by Tunisia’s Walid Ktila, while his British team-mate Isaac Towers placed sixth. There was also a sixth-place finish for Zac Shaw in a T13 100m won by Ireland’s defending champ Jason Smyth. Michael McKillop claimed a second gold for Ireland with T38 800m victory. Fresh from her T53 200m bronze, Samantha Kinghorn finished fifth in the 100m event behind winner Lisha Huang of China, who clocked a championship record 16.29. Joining Holt in her world record-breaking ways on day three was Cuba’s Omara Durand, who clocked 23.38 over 200m having also broken the T12 400m record the day before. China’s Zhanbiao Hou broke the world F46 discus record three times on his way to victory, eventually claiming gold with 52.64m. Netherlands’ Marlou van Rhijn took the T43/44 200m title, the ‘Blade Babe’ beating France’s T44 long jump champion Marie Amelie Le Fur 25.75 to 26.58.